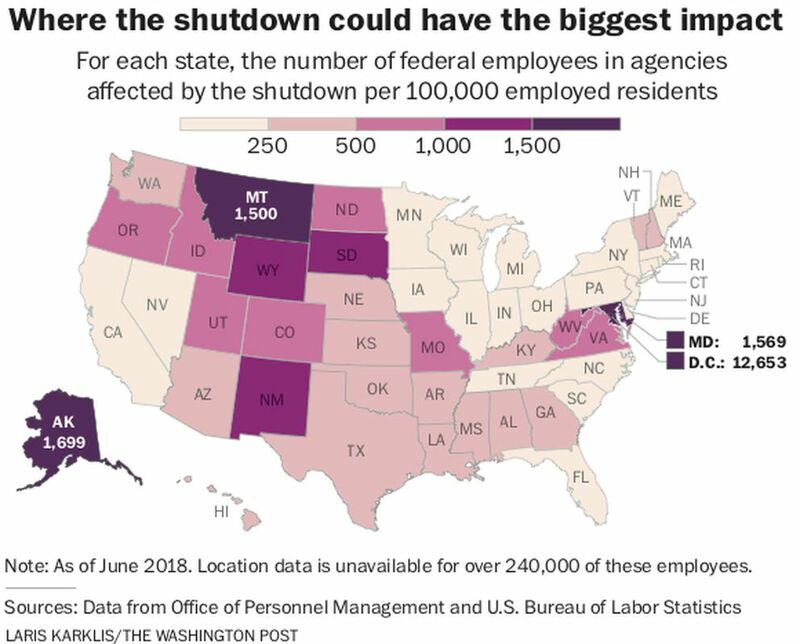 About 5,700 of Alaska’s 15,100 federal employees are likely affected by the shutdown - about 1.7 percent of its entire workforce, according to an analysis of federal data by the Post’s Ted Mellnik, Laris Karklis and Kevin Schaul. That’s more than three times the national rate. Hundreds of those workers applied for unemployment benefits in the three weeks ending Jan. 11, according to Patsy Westcott, employment and training services director at the Alaska Department of Labor and Workforce Development. That’s up from 40 such claims in November. Westcott said she expects the claims to be “higher than normal” for the duration of the shutdown. It’s one of many small signs the shutdown is beginning to take a toll in the state, especially in its vital fishing industry. But state economist Karinne Wiebold said she wasn't revising her forecast that, in 2019, the state will see its first job growth since 2015. But time is running out. Major commercial boats are required to carry onboard observers to monitor their catch. But when they return from a trip, those observers must be debriefed by the National Marine Fisheries Service - and it's not holding debriefings during the shutdown. Stacey Hansen, who manages North Pacific observers at Saltwater, said five of her employees were unable to work because they hadn’t been debriefed. Three of them are among the limited pool of observers who hold higher levels of certification. If qualified observers aren’t available, otherwise ready boats will be forced to remain in port. The season for Alaska pollock begins Jan. 20. It was the most-caught fish worldwide by weight in 2016, according to the U.N. It's common in breaded fish products, including the McDonalds Filet-O-Fish sandwich. In the past three years Alaska has shed about 11,100 jobs, or 3.4 percent of its workforce, largely with the slowdown in the oil and gas industry. "We had a cascading effect of job losses - all starting with the reduction in oil and gas," Wiebold said. Alaska’s government depends on oil revenue. When prices fell, state tax revenue fell dramatically. Oil and gas companies and the state government laid off employees and slashed spending on construction and professional services. The businesses that depended on them suffered, and the recession spread. 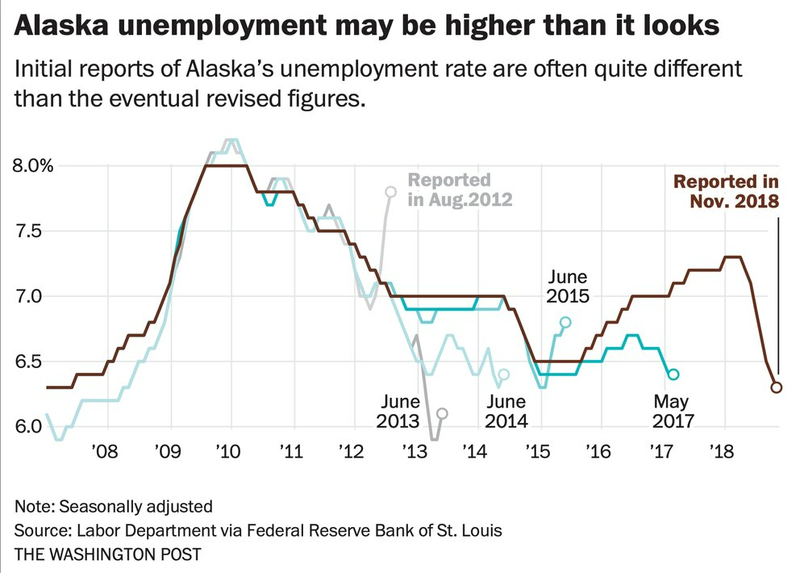 Alaska also has the highest unemployment rate in the nation. It stood at 6.3 percent in November, the most recent month for which figures are available. The state tends to report higher unemployment than the nation as a whole due to a highly seasonal workforce and high rural unemployment,. Labor Department figures show the state's unemployment rate has fallen significantly since April. But it's a good idea to be cautious. Federal officials often revise state figures as better data becomes available, and Alaska is no exception. Wiebold says it's possible the apparent fall in unemployment will be less dramatic when revised. That's happened several times in recent years. Before the shutdown, Wiebold saw several reasons for optimism. The Defense Department is spending a half-billion dollars to prepare the facilities at Eielson Air Force Base, outside Fairbanks, to serve as a base for two squadrons of F-35 fighter jets beginning in 2020. There’s talk of drilling jobs returning to the North Slope. She expects tourism, a bright spot amid the state’s slump, to continue to set records. There is concern the shutdown could hurt businesses which depend on national parks and other federal lands. At Denali National Park, visitor centers are empty and roads are closed. But at Backwoods Lodge in Cantwell, just outside the park, owner Carol Croteau said business had been "fabulous," and summer booking hadn't slowed. "We had our best year ever last year, by far," Croteau said, adding that she didn't expect the closures to hurt the lodge. "If the shutdown doesn't last forever, then I think we're going to be able to pick up and move on," Wiebold said. She added her calculations may change if the government remains shuttered during "pivotal periods" when fisherman or other workers who rely on the state's federally regulated resources need permits or inspections. Mark Zandi, chief economist at Moody’s Analytics, has long analyzed the state-level effects of government shutdowns. He said the assessments of the shutdown’s impact would vary based on whether the government can keep key programs running, as well as on how long the shutdown lasts.